Subscribe for your chance to win an amazing trip of a lifetime for 2 to vibrant Vietnam valued at up to $10,000! - MyMagazines - Subscribe online and save. 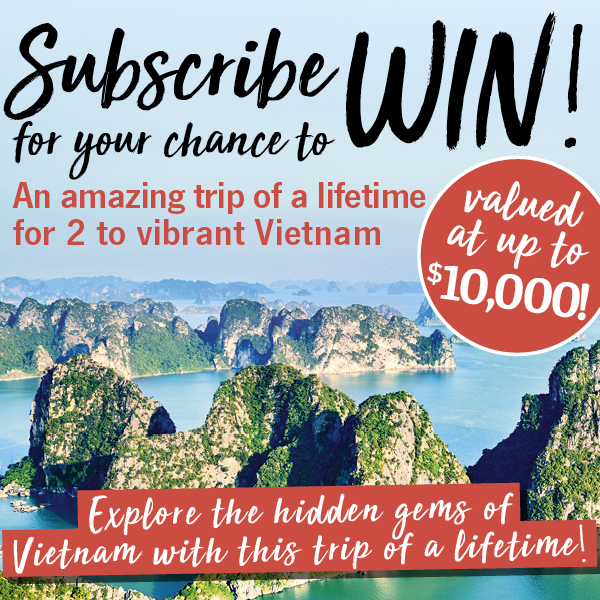 Home | Subscribe for your chance to win an amazing trip of a lifetime for 2 to vibrant Vietnam valued at up to $10,000! Subscribe for your chance to win an amazing trip of a lifetime for 2 to vibrant Vietnam valued at up to $10,000! Experience the key highlights of Vietnam in this concise 10-day tour. From the beauty of Halong Bay to the fertile Mekong Delta, you’ll get a fascinating snapshot of this captivating country. These tours are designed for those who wish to see the iconic sites and magnificent treasures of Southeast Asia while travelling with like-minded people. The tours are fully inclusive with the assurance that all your arrangements are taken care of by Wendy Wu Tours whose expert local and national guides offer unparalleled knowledge to ensure your holiday is unforgettable. HOW TO ENTER: Simply subscribe, extend or renew your subscription to any print magazine participating in this promotion for a minimum of one year. To be eligible to win, entries must be received by 11:59pm AEDT 14/6/19. Participating titles: Art Almanac, Australian Camera, Australian Guitar, Australian Hi-Fi, Australian Mountain Bike, Australian Muscle Car, frankie, Gardening Australia, Golf Australia, Healthy Food Guide, Inside Sport, K-Zone, Little Angel, MAD, Mania, Old Bike Australasia, Organic Gardener, Prevention, ProPhoto, Science Illustrated, Smith Journal, Soap World, Sound+Image, Total Girl, Tracks and TV Soap.